Posted 31st August 2016 by Josh Schouten. Due to popular demand Momentum Training will be adding a specific rowing class to the weekly schedule in September. On Thursday 8th, 15th, 22nd, and 29th the 7:30pm the CrossFit class will become a rowing class. Luka Špik, Olympic Rowing Champion, will be run these classes throughout September as a trial. 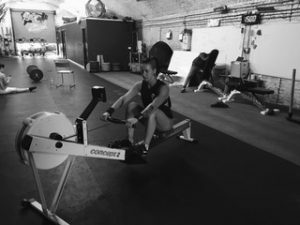 This class will focus on rowing technique and rowing fitness. Each week Luka will guide and challenge members to improve their anaerobic and aerobic rowing capacity. Rowing has a fantastic strength and technique carry over to many other CrossFit movements, as well as serious fitness. Leaning how to row efficiently, how to read all those crazy number on the screen, and how to pace yourself over long distances is a very valuable lesson for all athletes. These classes are part of you existing membership and all CrossFitters are welcome to take part in the sessions. Please be aware that the class is limited to 7ppl, as we only have 7 rowing machines.